Book is a big 8.5" x 11" size for ease in study purposes and has 172 pages with larger font than most books. The cost is kept at a bare minimum of $8.68 per book plus shipping, with no profit going to author, and there is no middle man. Buy direct from printers and save big time. This may very well be the most important book you buy this year. The information it contains is timely, revealing, and important. 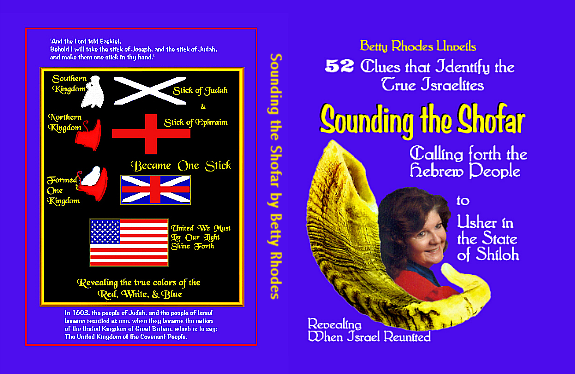 "Sounding the Shofar" is not a continuation of any previous book by Betty Rhodes but contains new material in regards to the Lost Tribes of Israel, the State of Shiloh, and the Messiah. THIS BOOK WILL NOT BE SOLD IN BOOKSTORES. BUY DIRECT FROM PRINTER AND SAVE. Click on cover art to view larger images of front/back covers. To view storefront and to purchase book, click here. When chosing shipping method, 'media' mail arrives just as quickly as 'priority' mail in USA. As a rule, you will receive your book within 8 days from order date. NEW information pretaining to the identification of the 'Lost Tribes of Israel', some of which has never been published before. This is a must read for those who are interested in the 'lost tribes of Israel', but also vitally important for all Christian peoples and nations to read. THE ENTIRE TRUTH IS UNVEILED. To view table of contents click here. 'The Man of Sin' is revealed in this book, and no, it is not Esau - you will be shocked to learn who tempted Jesus and who had Jesus killed, who authorized the building of the 2nd temple, and who the 'head' is that is over the Israelites, while the true Israelites remain the tail. Learn why 1993 started a downward trend for the nations of Ephraim. What must Ameria and the UK do to retain Jacob's blessings? Who is the anti-Christ? Anti-Christ means anti-anointed - the anointed ones are the true Israelites - anyone against the true Israelites can be termed the anti-Christs, as 'christ' means 'anointed'. The true Israelites are not who you think they are - read the book to see if you are one of the Israelites and what your next action should be. All heads of State should read this book, all Ministers should read this book, all Christians should read this book. Sounding the Shofar contains 52 proof positive clues that unveil the identity of the true 'lost tribes of Israel'. That's how important this message is. Those who say they have an important message that all people must read and then charge an arm and a leg for their 'special' wisdom are wrong to do so. To buy the actual book direct from printers. Click above. Many of you are probably unaware of your family's origins beyond the point when they first came to America. Chances are, if your family originated from England, Wales, Ireland, Scotland, Germany, France, Belgium, the Netherlands, Denmark, Sweden, Norway, western Russia, and other western European countries, you are one of the multitudes that make up the 'lost tribes of Israel'. The time has arrived for Jacob's descendants to awaken from the wilderness protection plan [Christianity] and take responsibility for their people and for the way of the world. Many things are taking place behind the scenes today that some of you have never considered - and if the true Israelites remain asleep at the helm, we might not like what occurs to our wonderful blessed free nations. 'Sounding the Shofar' contains 52 Clues that give positive proof of who the Israelites truly are and who they are not. Please read what this timely book has to say - we need to unite together for strength. You will not find this book offensive to Jesus - quite the contrary. This book identifies who really was behind the murder of Jesus and the disciples, and it reveals the 'man of sin'. It reveals 'Shiloh' and the responsibility of the true Israelite nations. I am not asking you to give up your religion or your belief in Jesus at all, but to intensify your strength in what is right and what is wrong. This is a call to action. I have never been one to promote any religion, but if there was ever a time for all Christian nations to become strong - together - it is now! Protestant churches need to get over their differences of opinion and unite under one name - divided as they are [today] does not bring on strength - only petty diversity. What America is facing is a serious situation and if we don't remain a strong powerful country in the world, all free nations will fall like dominoes - the extremists will fill the power void - and that will not be a good thing. Western 'Christian' nations were meant to be the superpowers at this time in history, but as 'Ephraim' they become a pancake only half done because of stupidity - not because of any curse - but by their own undoing. In addition to that danger, many black churches in this country preach hatred of the whites, much as the Muslims preach hatred of the Jews. These particular blacks, as well as other minorities in our land, have been biting the hand that feeds them for way too long, and we just go right on allowing this to happen because some people have a guilty conscious. The guilt trip has to stop soon because it is doing nothing but weakening our great nation - a nation given to us as part of Jacob's blessing. As the true 'lost tribes of Israel', descendants of Jacob, it is time we step up to the plate and hold on to our blessings before it is too late. Why should we voluntarily allow the enemies of Jacob to mock his good name, to take control of the horns that were meant for 'Ephraim'. My book, "Sounding the Shofar", gives positive proof of who the 'Israelites' really are, and who the "Israelites" are really not. It also gives solutions on how to keep America strong - keep Jacob strong. Many citizens here in the US are ignorant in so many ways - they don't realize what is happening right in front of their faces, and furthermore, they naively embrace trouble with arms wide open. The situation is becoming serious. Our government has sold out our nation to 'strangers' - we are a 'pancake' half done, and losing our 'voice' more and more every day. The more non-Israelites we bring into this country - the smaller our voice becomes. If a government does not work for the good of the majority of its natural citizens, then it works AGAINST them - this is a fact that is demonstrably obvious. Everyone living in a free nation needs to read "Sounding the Shofar", so here is a link for the e-book. You may give it to others as well - I don't make any money off the book but have written it for the sake of Righteousness. Christianity was set up for the 'lost tribes of Israel' and must not be forced upon other peoples as it was not designed nor meant for other peoples. Matthew 10:5-6 "Go not into the way of the Gentiles, and into any city of the Samaritans enter ye not: But go rather to the lost sheep of the house of Israel." Gentiles are non-Hebrew peoples. If you are from the white race, chance are you are an Israelite from the original Hebrew peoples - we must retain Jacob's blessings. This book is vitally important for all Christian nations today. Esau has stolen back the birthright from Jacob, and has stolen Palestine from Ishmael - the true Israelites must turn back their mindset to their origins - the sooner the better. It is the only way to stop terror in the world. It is the only way to have peace in the world. If a government does not work for the good of the majority of its natural citizens, then it works AGAINST them - this is a fact that is demonstrably obvious. The Isles of the United Kingdom, which include Ireland, Scotland, and England/Wales; Canada; Australia; New Zealand, the United States of America; Denmark; Germany; Switzerland; Austria; Liechtenstein; the Netherlands; Belgium; Norway; Sweden; Finland; Iceland; Latvia; Lithuania; Estonia; Russia; Ukraine; Czech; Poland; and others, are countries and nations given to the tribes of Israel after the 2520 years expired. All these nations ABSOLUTELY MUST WORK TOGETHER AS ONE UNIT TODAY – the sooner the better. These nations represent JACOB, and we must not let Jacob’s inheritance slip away. The enemies of Jacob are just as real today as they were thousands of years ago, which include the descendants of Cain, Ishmael, and Esau. If you do not believe these three factions are working against Jacob's descendants, then take a look at the links seen at right. The Creator is Spiritual and can best be 'discovered' in the spirit (mind/soul). You will never see the Great Spirit posing as a ‘physical’ entity lurking around like a shadow of elusiveness to anyone. The Almighty Creator is Omnipresent - found everywhere in a million galaxies, as well as on Earth. IT is a sovereign power and energy and the only giver of the life force within each and every one of us, regardless of race, religion, or country of origin. All life contains a portion of the Spiritual essence of our Creator.